Start reading Bloodlands: Europe between Hitler and Stalin on your Kindle in under a minute. Timothy Snyder is Professor of History at Yale University. He is the author of The Reconstruction of Nations, Sketches from a Secret War, and The Red Prince. He lives in New Haven, Connecticut. A remarkable account of an atrocious period of world history. Brilliantly researched and written in a way that is easy to follow. A must read for anyone interested in history, particularly European history during WWII. This was a difficult read. Not for the writing but for the content. As a Canadian of Ukrainian descent, the Holodomor or murder by hunger, was a topic of incredible sensitivity and division within our community. Of course, Snyder's tremendous contribution to the examination of Stalin's and Hitler's terror covers more than the Ukrainian famine. He ingeniously casts a light on a geographic area he calls the Bloodlands, where the dictators and their regimes murdered 14 million people from 1933 to 1945. The Bloodlands extends from central Poland to western Russia, through Ukraine, Belarus, and the Baltic States. Ukraine was the epicenter where the most lives were lost in WW2. Snyder points out that while Hitler's record was atrocious in war, Stalin's was in peacetime and collectively their actions are near unimaginable. Snyder begins by examining the Ukrainian famine that began in 1933. It was prompted by a failed five year plan and the effects of collectivization. Stalin, loathe to take responsibility, blamed the peasants and "agitators". The author takes a logical view on the lives lost based on the available information and arrives at 3.3 million. This has always been a contentious issue with Ukrainians but Snyder states his assumptions objectively and this adds to his credibility. Snyder then covers the deportation of Kulaks, the decimation of the Poles from two sides, Jewish persecution and The Holocaust, and economic and ethnic intentions and actions in the Bloodlands. In fact, if there is an explanation for the killing, Snyder roots it in agriculture. Stalin wanted to collectivize farmers; Hitler wanted to eliminate them so Germans could colonize the land. The book's scope is overwhelming especially to those new to this period. And the first hand accounts are disturbing to say the least involving cannibalism, neighbor turning against neighbor, and the aggregate hardships faced by the inhabitants of the Bloodlands. "It is not difficult, for example, to conjure the image of a young Ukrainian patriot in what used to be eastern Poland who, just before the outbreak of World War II, is drafted into the Polish army, but following the Soviet invasion of eastern Poland in September 1939 automatically becomes a Soviet citizen and is drafted into the Soviet army. Captured by the Germans in 1941 and confronted with the choice of starving to death in a POW camp or becoming a policeman in German service, he chooses the latter, and in the next few years he fights Soviet partisans and shoots defenseless Jews. In 1943 or 1944, he goes over to the partisans, as so many other Ukrainian policemen were doing. Soon, we find him in a Soviet uniform again, serving in a combat unit. He makes it across Central Europe, fighting against the Germans, but at one point he deserts, joining the countless other Red Army deserters who are indistinguishable from bandits, and who drift behind the combat units. Finally caught and accused of desertion, he ends up in the Gulag." This book is tough to read but important for this point provided by the author, "The Nazi and Soviet regimes turned people into numbers. It is for us as humanists to turn the numbers back into people. If we cannot do that, then Hitler and Stalin have shaped not only our world but our humanity." Having read hundreds of books on World War II, it's pretty rare to come across a book which covers a topic I'm not very familiar with. However, the subject of the Holocaust is one which I've avoided mostly because it's just too damn depressing, and while this book covers a broader topic it's probably one I would have skipped in the past. I'm glad I didn't skip this one. 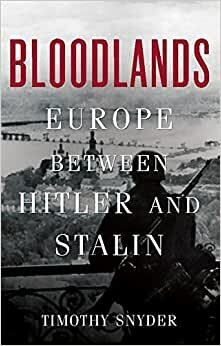 The author defines the Bloodlands as the lands between pre-war Nazi Germany and the western edge of the Russian Republic, predominantly Poland, Belarus, the Baltic States and Ukraine. I was unaware this book would not focus on the military action(s) and instead focus on the ordinary citizens in these areas as I had not read any reviews prior to starting this book. I have to say, this is one of the best books I've read in quite some time, and the fact it covers a subject I've avoided has opened my mind to wanting to learn more. The author recounts how first Stalin and then Hitler undertook various programs/campaigns against the Polish, Belorussian, Ukrainian and Baltic populaces, as well as against those of the Jewish faith. In a combined campaign of extermination, over 14 million people were killed essentially because of where they lived, what religion they practiced, or if for some reason they were viewed as a threat. Along the way, author Snyder does a really good job of explaining the rationale behind the murderous schemes of Stalin and Hitler and how they fit into the grand plans/ideals of the Nazis and the Soviet Union. Along the way, the reader will encounter multiple personal vignettes about those who there, many of whom did not survive. The story is truly horrifying and the sheer numbers staggering, yet Snyder has woven together an excellent narrative which doesn't get bogged down in either horror or numbers. I'd recommend this book to anyone who wants to know more the events in the Bloodlands from the late 1920's through the early 1950's--it truly is an excellent read. One such number is 33,761. That is the number of Jews shot at Babi Yar, near Kiev, in the Ukraine. On numerous occasions throughout this monumental and essential history, Timothy Snyder uses very precise figures such as 33,761. Admittedly, it rubbed me the wrong way, since in the world of much uncertainty, as Heisenberg and others have proclaimed, it is impossible to know such a number, with that type of certainty and precision. But on the very last page of his account, the author, a Yale historian, explained fully why it is so important to use the “odd” number. It is the humanity that is revealed in the “1”, which can be multiplied by a million or more. It is the fragments of the stories of individuals who once had a real name, that have been preserved in diaries, or the memories of others, or simply a departing sentence scratched on a wall. Snyder does also use “round” numbers, as in 14,000,000. That is his estimate of the number of CIVILIAN deaths in an area he defines as the “Bloodlands,” between 1933 and 1945. It is an area that stretches from St. Petersburg in the north, encompasses the entire eastern shore of the Baltic to Danzig, all of Poland, and on, down to the entire Crimea, and touching the Don River in the east. One of the many strengths of this book is the numerous excellent maps set within the narrative. His contributions to our understanding of what happened in that space and time are numerous. Central is his examination of the disparate motives behind these numerous deaths, and to present a “balanced” account, in a world of madness. Snyder starts in the Ukraine, with Stalin’s efforts to collectivize agriculture, which lead to the death, by starvation, of millions. Many others were deported to the “Gulag.” Next there was the “Terror,” in the late ‘30’s, in which Stalin purged many in the leadership ranks of the Soviet Union, with a particular focus on the Poles. In fact, the “Polish Military Organization” was simply invented for the purpose of justifying the terror. Though the Soviet Union promoted an image of their tolerance towards minorities, which many in the West, probably at one time including myself, accepted, with the “you can make an omelet without breaking a few eggs” rationalization, Snyder concludes otherwise, to a stark degree. Next there was the brief period that Nazi Germany and the Soviet Union were allies, which, in part, resulted in the partition of Poland between them, and the calculated decimation of the Polish leadership. What more can be said about the Holocaust and the Jews? Actually, quite a lot, I found. Once again, Snyder condemns best in measured, factual analysis. He deals with the “big picture,” and demonstrates how, after the German failure to take Moscow in 1941, that the destruction of European Jewry became a wartime German objective. He names numerous concentration camps I had never heard of, because they were taken by the Red Army. Prior to reading Snyder’s account I was under the impression that the gas chambers had to be constructed because there was some natural “limit” whereby soldiers could not be ordered to shoot and kill unarmed men, woman and children, and be expected to obey. The soldiers themselves would simply rebel and refuse to participate in these heinous crimes. Not so, apparently, as the author documents how so very many were simply shot, including all those at Babi Yar. Amos Oz, the Israeli novelist once proclaimed that “the dead of the Six Day War belong to all of us; the dead of the Lebanese War belong only to their mother’s.” Snyder posits a similar issue concerning a Soviet Ukrainian Jew who had once lived in an area considered to be Poland. She can be claimed by four different national entities; who does she belong to? And to what political purpose today will these entities use her death? And like Bernard Schlick’s principle character in The Reader, who is accused of war crimes, but asks the Judge: “What would you have done?” and receives no reply, Snyder cautions against assuming the identity of the victim, and raises the issue of what people who are just “trying to get by” will do in order to stay alive… including being Jewish policeman in the ghetto. My first efforts to obtain a different vantage point on the Second World War, other than the one I was brought up on, as an American, that is, Pearl Harbor and D-Day, was reading Alexander Werth’s Russia at War: 1941-1945, in the ‘60’s. William Shirer proclaimed it to be “the best book we probably shall ever have in English on Russia at war.” I found it strange therefore that in Snyder’s extensive 37 page bibliography, it is never mentioned. Of course, some of Werth’s information and opinions, as set forth in 1964, are outdated and have been superseded. For example, Werth had left it an open question as to who killed the Polish officers in the Katyn Forest, the Soviets or the Nazis. We now know for certain it was the former, and Snyder details this. I also compared accounts concerning the doomed Warsaw uprising of 1944. I found Snyder’s account less rigorous, with the implicit assumption that the Russians had simply stopped, for no particular reason, and allowed the Poles to be slaughter as a result. Werth seemed to be much more explicit and detailed, clearly condemning “…the awkward questions of the Moscow radio appeals at the end of July to the people of Warsaw to ‘rise’… and the Russian refusal to let supply planes from the West land on Soviet airfields.” Also, it was clearly in Stalin’s interest to allow the Polish elites again to be decimated. Nonetheless, Werth quotes the German general, Heinz Guderian on the inability of the Russians to take Warsaw, cites the failure to cross the Vistula in July, with a loss of 30 Russian tanks, and Werth concludes: “The only conclusion this author, at any rate, has been able to reach is that in August and September, 1944, the available Red Army forces in Poland were genuinely not able to capture Warsaw, which Hitler was determined to hold.” At a minimum, I think Snyder should have at least addressed this issue, and Werth’s knowledge of the matter. Despite the above one flaw, I consider this an essential historical work. 6-stars. Perhaps it is because I am in my 90th year, but I cannot believe many Americans have any idea how gigantic was the slaughter of innocent men, women, and children (yes, even babies) under the Stalin and Hitler regimes. This book tells all, with gory details galore. I have visited several of the Nazi death camps. Nevertheless I had no idea (until I read this book) how awful was the carnage between 1920 and 1945 in Poland, Ukraine, Belarus, Germany, and other places.